But it is his insightful and original work on dust in our solar system for which he is best known. Contrary to long-held scientific belief, he showed there is no single source of the interplanetary dust cloud but several sources and that asteroids, not comets, dominate. This work revolutionized a well-entrenched science with potentially fundamental implications for our understanding of the formation of the solar system and related planetary systems. In 1994 his discoveries that the Earth is embedded in a circumsolar ring of interplanetary dust and that an enormous cloud of dust also forms behind the Earth and trails it in its orbit around the Sun were highlighted by NASA Administrator Dan Goldin as one of the four most significant discoveries of NASA in that year. His group also has shown that these unique dust disks may make it easier to detect other planets, especially Earth-like planets, around stars. This work is of great interest to NASA and is likely to be strongly pursued over the next two decades. Dermott also is pursuing a possible link between the accretion of extraterrestrial dust by the Earth and the Earth’s climate. The importance of such discoveries is evidenced by his publication of 37 papers in the last five years, including five papers in Nature or Science. Two of those papers, including one with the late Carl Sagan, made the cover of Nature. His research has been fully funded by NASA without a break since 1980. 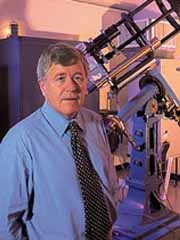 Since 1993, he has devoted much of his energy toward his goal of building the UF Department of Astronomy into one of the leading astronomy departments in the United States. He seems well on his way to this goal. The department houses the world’s leading microwave laboratory for studying light scattering by dust particles. Faculty are developing dust particle detectors for missions to Mars and beyond, as well as building infrared cameras that will be used on Gemini, one of the largest and most advanced telescopes in the world and, at $180 million, the biggest astronomical project ever undertaken by the National Science Foundation.